Mario Party returns for one more Wii installment! Hudson Soft, however, does not. 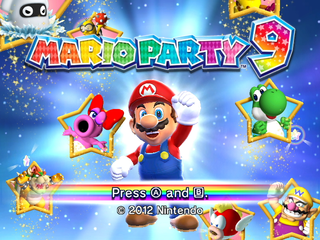 The game changes up the typical Mario Party gameplay a bit: coins can't be collected, you collect Mini Stars instead of Stars, and everyone moves around in a single vehicle, much like Mario Party Advance. But it's still got mini-games! 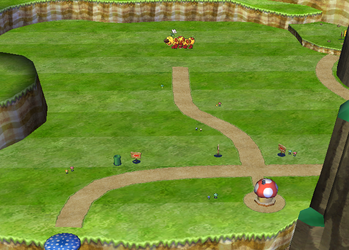 An early Toad Road stage can be found on the disc in the folder /common/bd00. Note that unlike the final version's course maps, this is all loaded in one chunk. The final game's boards have separate chunks for each "section" of the level. One of the most obvious features is that there's only one branching path in the stage—the fork in the road by the large star in the west portion of the map. The start of the board. The star marker at the start was changed in the final game to look like it's growing out of the dirt instead of just being slapped on. 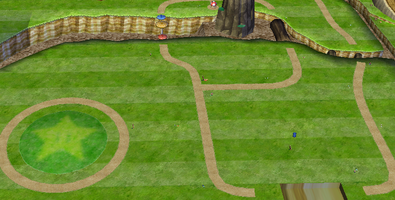 A ditch where a bridge would be is replaced by two tree stumps in the final game. The prototype version of Toad Road has three mountains, not two. The third mountain (where the vine grows) was replaced with a hill surrounded by a spiraling "staircase". The bog standard bridge was replaced with lily pad platforms. These ruins don't appear in the final game at all! What's more, they're part of the main path. 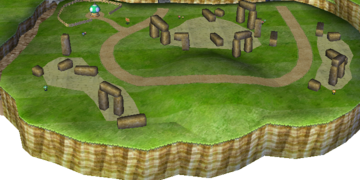 In the final game, this was replaced with a small island that's completely separate from the main area. The lower-left corner of the map is where a special Mini-Star filled area can be found. In the final this is on an island that's in the center of the main path, but this early version is completely removed from the main path and is landlocked. The strange mushroom platforms (which aren't scaled correctly) leading to the boss room are completely absent from the final game, as is the space ditch where a bridge would be. A picture of Wiggler marks where the Boss Gate is found in the final game. It seems that even in this early model, Wiggler was intended to be the boss of this board. Of course, the actual Bowser Gate isn't present at all in the early model. The image used for Wiggler is the official artwork from Super Mario World. Texture difference between the prototype and final level models. 64x128 128x128 The final version is clearly modeled after the vines found in New Super Mario Bros. The early texture doesn't have a top at all. 512x256 512x256 Same basic texture, but the final version is much shinier. Some of the colors were swapped around as well. 256x256 512x512 Final texture is much brighter and looks like it fits in a Mario game. 128x128 128x256 Final graphic is in the graphical style of NSMB. 256x256 256x256 Yet more texture brightening. 256x128 256x128 The final door is more defined than the early texture's door. 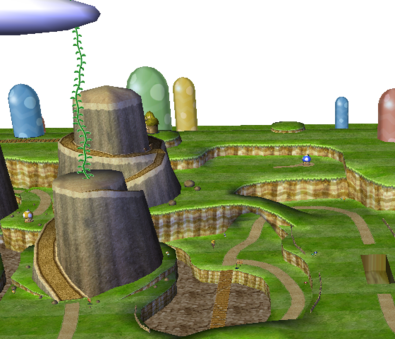 The early texture (and level model) also have graphics for blue, green, and yellow Toad Houses. All of the Toad Houses in the final game's level are red. 128x128 512x512 A pretty massive upgrade in texture size and quality of the mountain road texture. 16x16 16x32 Even this small rainbow texture got an increase in resolution and brightness! 128x32 256x64 The new texture is transparent at the top. 256x128 512x64 The final texture is simpler and doesn't have the sky color as part of the texture. 256x256 256x256 Completely redone to look more like a Mario game's graphics. 64x128 128x256 Larger waterfall = better waterfall. 32x128 32x128 The final texture is silver but is shaded gold by the game's lighting. 64x256 512x128 The early texture has graphics for a yellow windmill while the final texture does not. A 10 Mini Ztar space. In the final game these only go up to 5. A 10 Mini Star space. A mysterious space that seems to be filled with Mini Ztars. The texture's name suggest it was likely used as a minus Jackpot space. A +5 Magma Space. This would be used in Magma Mine. As it is, only +2, +3, and +4 spaces are used. A +3 Jackpot space. The mini-icons are +3 and +5; the actual icons are +5 and +8. This was likely changed so that the Jackpot Machine would be filled faster. An ordinary red space with no other features. Used in the previous games, but here a generic red space is pointless. A temporary event icon graphic found in the bd00 model file. The "stop" texture is blue (helpful) in the mini-icon model file and green (event) in the final icon file. Given the texture name compared to what it does in the final (Captain Event space) it's clear that the actual purpose of this space was changed. A placeholder card icon for the Dry Bones boss mini-game from mg9603/map.brres.lz. Similar dummy textures exist for the Toad House and Lakitu boss mini-games. The Japanese says "Miss". A placeholder basic representation of the Bumpty enemies, found in the "Polar Extreme" minigame files. Has no animations assigned. A balloon with the word dummy crudely written on it found in locale_us/en/mgm/layout/mgm_roulette_lc.lz/dummy.tpl in the USA version of this game. Another balloon with the word mask crudely written on it found in locale_us/en/mgm01/layout/mgselect_lc.lz/dum_f.tpl in the USA version of this game. Rip gifs of the animations. Bowser Jr. has unused animations for using a vehicle. These may have either been for testing or he was going to be playable at some point. This page was last modified on 26 June 2017, at 23:58.